Providing exceptional customer service is our number one priority, and we strive to make to make beautiful new floors easy for all of our nationwide customers. Your concerns are important to us, and we’ll be in contact with you soon to learn more and start working towards a resolution. My update: As of today (9/13/2017) Customer Service has told me that I had agreed to buy my own quarter round and caulking and they will install it. This is not true. I did not agree, I was only told that they do not not have quarter round or caulking that match the my flooring. I did not even have even a sample of the flooring to buy the quarter round and caulking. I was told that the lifetime warranty would be negated if I bought my own. I was sent a small piece of the vinyl while I was on a month's vacation. I am not going shopping for this and I expect someone to bring quarter round and caulking that are the same and match the floor and install it professionally. How hard is that? The photos show the unprofessional workmanship and white caulking. 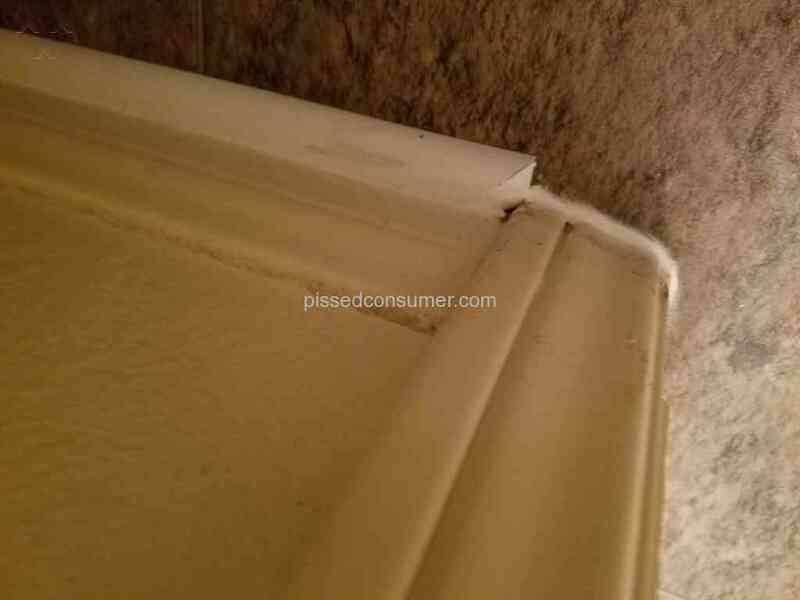 It also shows the baseboard damage at all corners. The damage to my baseboards and door was never addressed. I did not realize that there would be so much damage to my baseboards. It would make better to put new baseboards in than doing a fix up. The glue on the wall and door shows sloppy workmanship. Customer Service has tried to resolve my problem since the installation date. My original concern was the white caulking and quarter round on brown floor. I thought that caulking would be used in the area of tile in the bathroom, not around every corner. Which is very sloppy. Caulking is too generously used and it is white. I had wood floor installed downstairs and it did not look like this vinyl install. 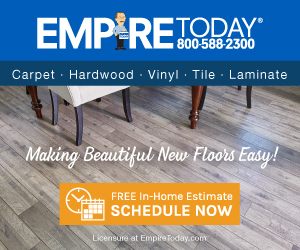 I am sorry I had this work done without getting other estimates, but I believed that Empire Today would have experience with flooring that would be professional. 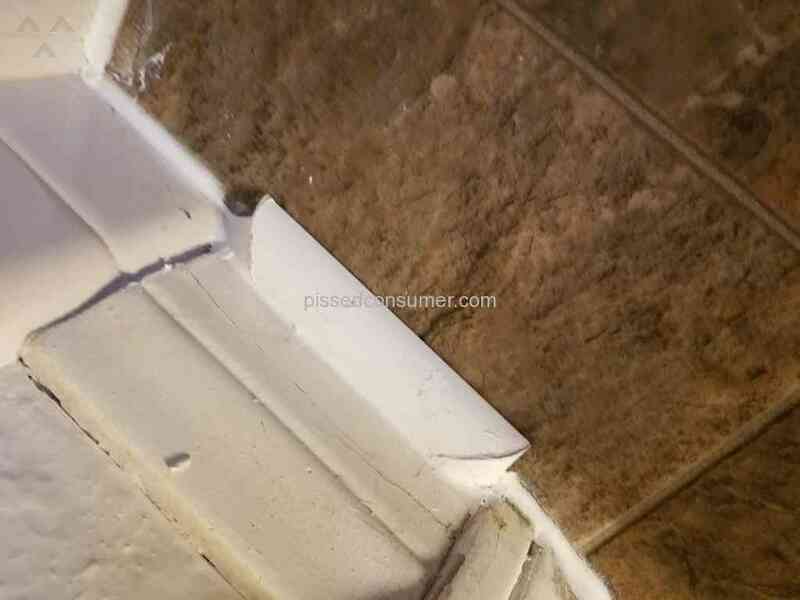 The salesman said that caulking would be used, he pointed to the tile, and that it would be a thin bead. There is not a thin bead anywhere. The vinyl is installed in one large sheet and cement is used to glue it down. The cement is on the wall in some places and on the door. 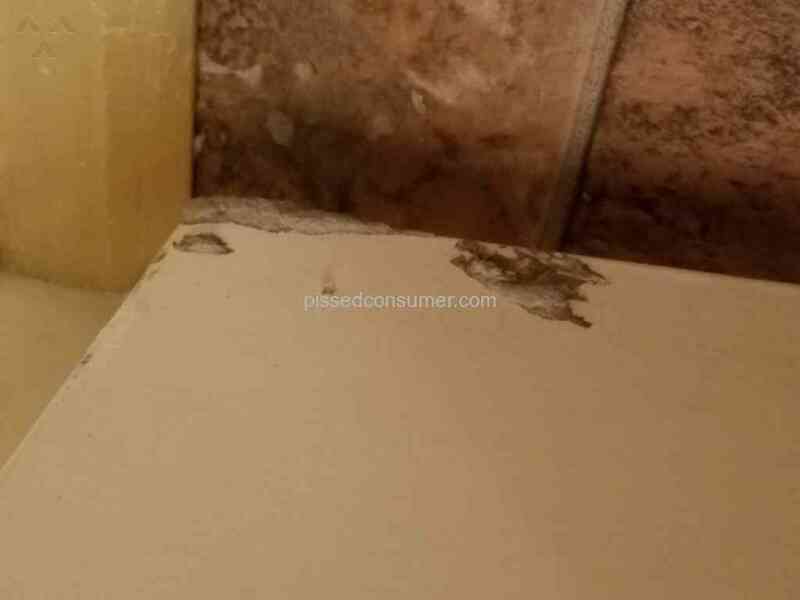 The baseboard shows damage or cement in different places. 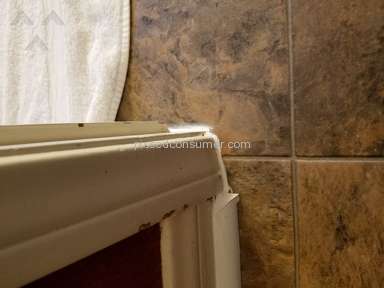 I do not know how this problem can be resolved without more damage to the baseboard and other areas. The tiles in the bathroom came loose and fell of when I leaned against them while the last installer was there. The tiles were not noticed as we have been out of town. I had listed my complaints before. Mainly I had been addressing the color not the damage. I should have included that also when I first began with the concerns. I had submitted photos before. I will submit them again. The last email conversation said that they do not have the quarter round and caulking to match my flooring and that I would have to go to the store and buy them myself. Not acceptable. Also the same poor installers were required to come back out to fix the problems. How could that work. If they thought they did a good job why would I want them back again? A supervisor came to inspect but did not mention the damage, which he could clearly see. I liked: Customer service representative. I didn't like: Damage done at installation, Solutions that did not work for me. Review #1095688 is a subjective opinion of toniburke.